I did this painting a couple of years ago of our son, Jared. Today is his 30th birthday (how can that be?) so it seemed appropriate to post this painting. When I painted this, Jared was webmaster and graphic designer for a travel company in La Jolla, California. He did much of his work at home on a laptop, and many late nights one could walk in and find him intently staring at the screen, his trusty French press coffemaker beside him; scrawled notes, Pepsi cans and calculators scattered across the table. Jared's ability to focus is amazing--he becomes completely absorbed. I set up a tripod and took several photos from about six feet away to use as reference for this painting. Later, when he saw the completed work, he was puzzled at how I had done it, since he hadn't even noticed I was there. I'm fortunate and proud that you are my son and my friend, Jared. Happy Birthday!! This is a fantastic technical effort but so much more...a real work of art. There is no question in my mind that the magic in this comes from your affection for the subject. It's funny how your love and understanding of whatever is before your canvas seems to come through. Your last sentence was very touching. Very well done here, I'm sure your son is proud. I remember this one. So touching. Great way to honor your son on his birthday. Aside from the fact that it is a touching post to your son on his birthday, it is a great painting. You really caught the light from the computer. Not an easy thing to do. And the light reflecting on his face is perfect too. So, where does this one hang, his house or yours? He has that artist brain and the ability the get in a zone, just used in a different direction. A nice honor to our sons 30th birthday. It doesn't seem possible that our children are older than we thought we'd ever be. Todd, you have a generous spirit. I thank you for your kind comments. Hi Silvina. Thanks for coming by. It's always great to hear from you. Thanks so much, Frank. You're such a fine painter and your comments are very meaningful to me. This painting hangs in our house, at least for now. You're sure right about how fast time goes by. And I come from the generation whose slogan was "Don't trust anyone over 30." glad you clarified! i figured laura was your wife! and funny that your son didn't even notice you there! I was drawn to this painting as soon as the screen openned and I like it even more now that I have read your words Don. What a superb painting and such a priceless tribute of the love you have for your son. Thanks Martha, good to hear from you. Are Aries people noted for their ability to concentrate? Thank you, Triecia, I loved doing this painting. Congratulations with your son! Love the painting, the funny thing is I just posted one with a similar theme, yours is great! What are the odds, Gerard! I was just looking over the DP site tonight and noticed your painting before I read your comment here. They really are similar, aren't they? Great minds must think alike :) Thanks for stopping by. yes - aries is the RAM - single-mindedly headed where they need to go! Excellent painting of your son. An image most of us can relate to in modern life. Many things in life can only be felt not seen or spoken... what a great way to express yourself. 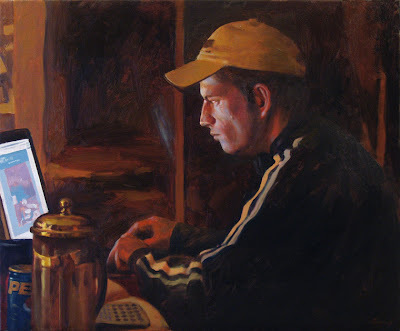 Great to see some figurative work make it to the blog, Don, and as others have noted, it's a great piece! I love the way you paint and the emotions you show through your painting. Beautiful style! Nice to hear your thoughts, u19998nc. Hi Jason--thanks. I've really been enjoying the color combos in your latest posts. Jennifer, you're very kind--thank you.